Recipes for seniors are challenging. Whether an elderly person lives independently, with family or in a care home, it is often struggle to get the nutrients needed for optimum health. Sometimes low appetite can play a factor in eating a variety of healthful foods; for others, chewing, swallowing and digestion can become a barrier to eating well in older age. Smoothies are a wonderful solution to ensure seniors get the nutrition they need. 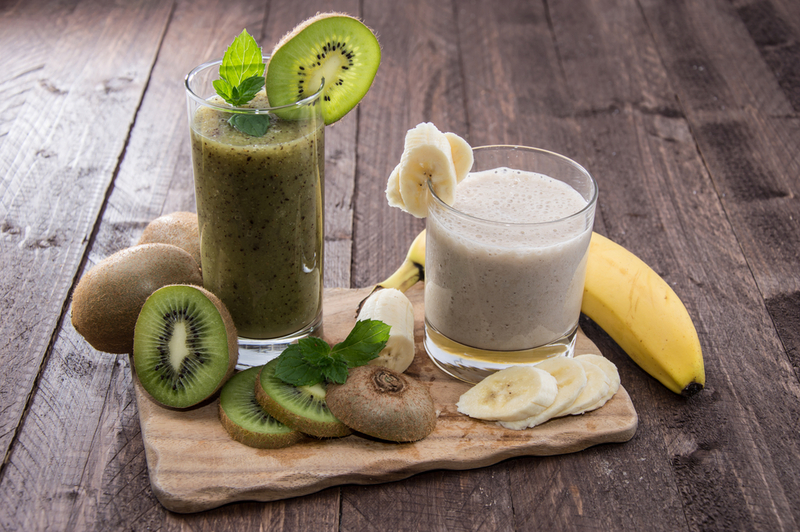 These quick and healthy smoothie ideas provide an easy meal solution packed with a nutritional punch to help maintain health and stave off illness. This delicious smoothie recipe from Tracy Russell’s website, Incredible Smoothies, provides healthy vitamin C and all the benefits of kale, a good source of calcium. The combined flavor of orange, kiwi and pear help “hide” the vegetables. Liquefy the kale with water before adding the fruit, then blend all other ingredients until smooth. Sourced from the Eating Well website, this filling banana cocoa soy smoothie is a treat for older adults who enjoy the taste of a creamy chocolate milkshake. The tofu and soymilk provide the creamy texture and a good dose of protein — essential for maintaining healthy body tissues, the creation of enzymes, and a healthy immune system. Blend the tofu, soy milk, cocoa powder and honey before you add the frozen banana through the top hole in your blender. Puree and add more soy milk as needed to achieve the desired texture. Blueberries add rich anti-oxidants to this quick and easy Green Tea and Blueberry smoothie, providing a healthy boost to the immune system and brain cells. For additional health benefits try adding wheat germ, steel-cut oats, chia seeds, coconut oil, hemp hearts or flax seeds to this smoothie found on Jennifer Wegerer’s blog, A Place for Mom. Steep the green tea bag for three minutes then remove the tea bag and add honey. Blend with fruit and soy milk until smooth. Need a Hand with Meal Planning? Grove Menus can help you prepare healthy meals for your small, medium or large senior care or assisted living facility. Get in touch with us at (208) 528-0690 today!